We are one of the recognized names in industry engaged in retailing, supplying and trading of a wide array of superior quality glass and glass products. To retain our goodwill in client's consideration, we are providing an excellent quality range of Aluminum Glass Partition. We are specialized in offering Frame-less Glass Partition in various sizes, shapes and finishes. This finds wide application in various offices and commercial places. The glass partitions offered by us can be customized as per the desired designs and specifications of our prestigious clients. 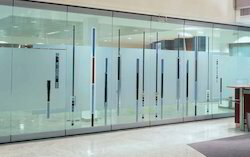 We take pleasure to introduce ourselves as one of the renowned firms for providing the best-in-class range of Office Partition Glass.